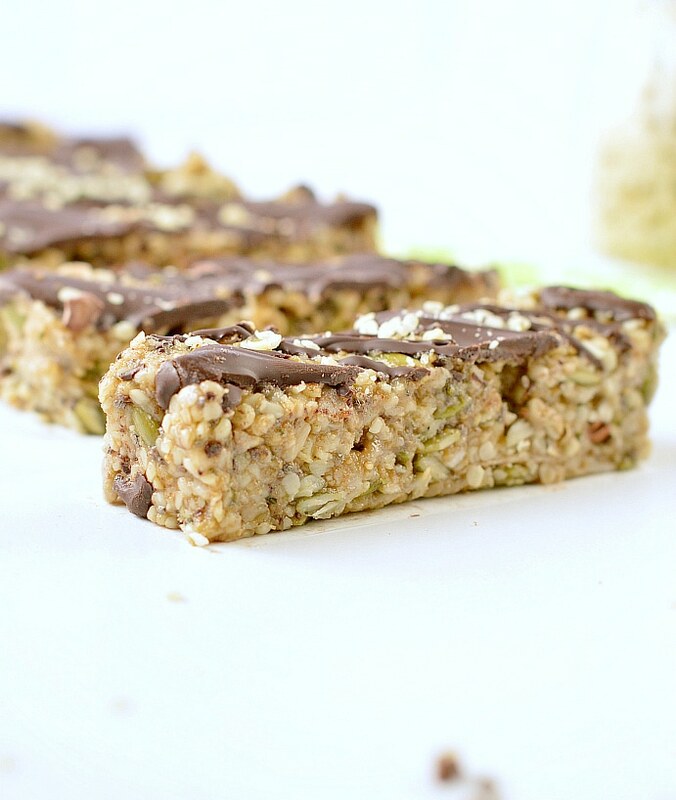 Not long ago I shared with you my low carb granola bars recipe and it was a great success. Some of you requested a nut-free version of this easy low carb recipe. 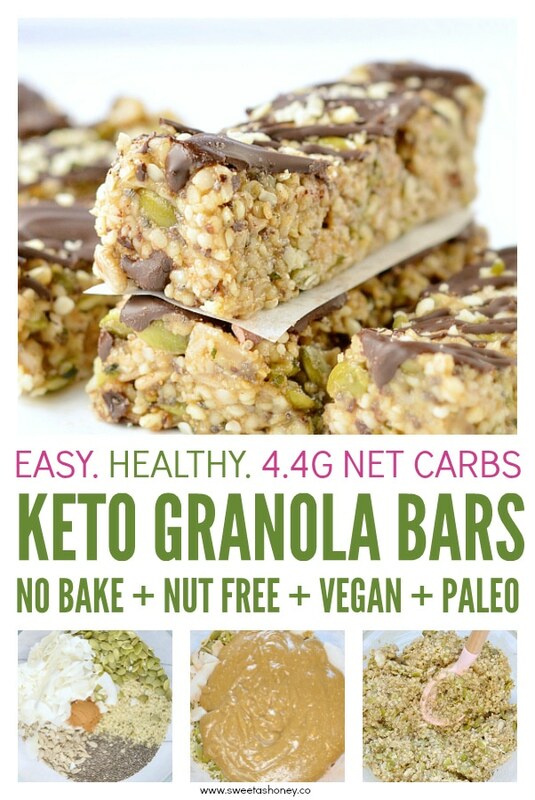 So here you go, those no-bake keto granola bars are for you, 100% keto + nut-free + vegan + gluten free. 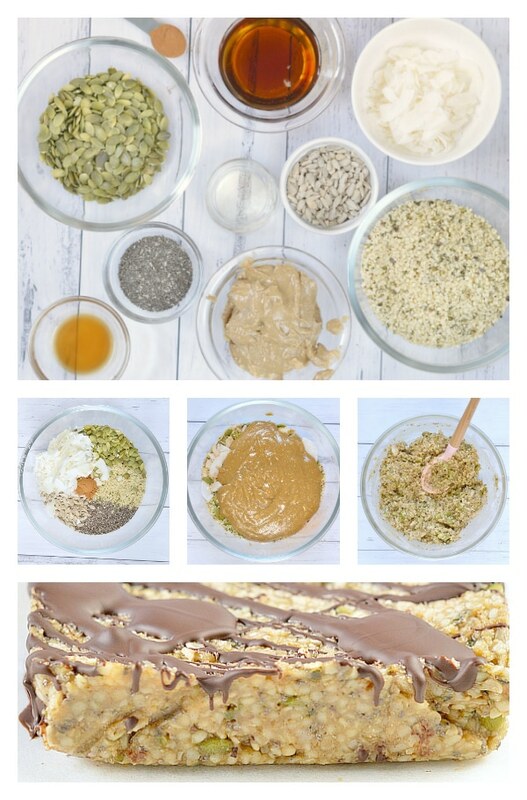 All you need to make those simple keto granola bars, or should I say seed bars or hemp seed bars, as this is the main ingredient in those breakfast bars. Hemp hearts – or also known as hemp seeds are seeds from the hemp plants. Yes you read well, the cannabis plants, except the seeds contains only trace of THC so you are totally safe eating those. Hemp seeds have amazing nutritional value. They are high in healthy fats, fiber, proteins and very low in carbs with only 1.4 g net carbs per serving of 30g. Amongst all seeds, they are the one with the optimal ratio of fatty acids, omega-6 to omega-3 meaning they are powerful seeds for healthy skin and reduce heart disease. If you are vegan, those seeds will bring you the highest amount of plant-based protein, 25% of calories are protein which by weight is similar to beef. Amazing right ? Extra virgin coconut oil – you can use refined coconut oil or unrefined. Unrefined is the purest but it has a strong coconut flavor. I recommend refined coconut oil if you are not a coconut lover as me. Sunflower seed butter – this is an amazing nut-free alternative to peanut butter on a low carb diet. Sunflower seed butter is often found in the healthy food store or organic aisle of your supermarket. I know that on a low carb diet we are obsessed by counting net carbs, which as a reminder is the amount of total carbs taking away fibers and sugar alcohol. But could we stop a second and consider the micro nutrient panel of those keto granola bars as well? Those are definitely super seed bars, one single bar contains 45% of magnesium . If you are on keto low carb diet for a while, you should know that supplementing with magnesium is recommended. This helps stabilize blood sugar level, decrease muscle cramps or help with sleeping issues. So those bars, are not only delicious keto granola bars to starts the day. They are natural magnesium supplement packed in a tasty on-the-go breakfast bar. Those hemp seed bars are no-bake granola bars and must be stored in the fridge or they soften too much. Well, it is fine to carry them along for 20 minutes at room temperature. But if you want to keep the shape of the bar, enjoy them straight away from the fridge. Something I like to do if I plan to eat them within 3 hours, I freeze my bars the day before. Then the next day I carry them frozen, defrost along the way and perfect by the time I want to eat them ! Clever right ? Always a solution to keep your low carb diet on track, you see. 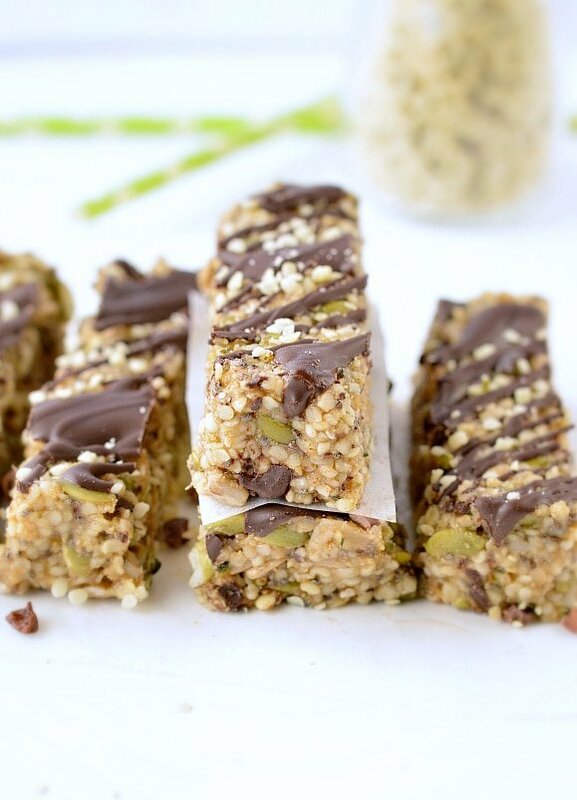 Enjoy the lovely keto granola bars and before you dig in, share a pic with me on Instagram! You know I look at all of them and love it . 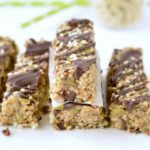 Look at the keto granola bars recipe video and make them now ! KETO GRANOLA BARS - easy chewy no-bake hemp seeds bars 100 % Nut Free + Grain Free + Vegan with only 4.2 net carbs and 9 g protein per bars. Line a a loaf pan, size 9 inches x 5 inches, with parchment paper. Set aside. In a medium mixing bowl, add all the dry ingredients, order doesn't matter. Stir, set aside. In another mixing bowl, add sunflower seed butter, melted coconut oil, sugar-free syrup and vanilla. Microwave 30 seconds, stir, microwave 30 seconds again if your sunflower seed butter is too hard to combine. You must obtain a thick brownish paste. If you don't have a microwave, bring on a stove in a small saucepan, stirring often until the ingredients are combined. Pour the seed butter mixture onto the dry ingredients and combine with a spoon until the mixture cover all the dry ingredients evenly. Transfer the mixture into the prepared loaf pan, press with a spatula firmly to compact the granola bar mixture as much as you can. Freeze 20 minutes to set. Meanwhile, melt the sugar-free chocolate chips and coconut oil in a small bowl. You can microwave by 30 seconds burst, or use a saucepan under medum heat. Bring the bar out of the freezer. Lift the parchment paper to pull out the bar from the loaf pan and place on a plate or chopping board. Drizzle the melted chocolate on top of the bar and bring the bar back to the freezer for 2 minutes to set the chocolate. Cut into 10 bars, I recommend you warm the knife blade under a flame or hot water (dry the blade to avoid water to be added to the bar). Store the bars in the fridge in an airtight container for up to 3 weeks or wrap individually into plastic wrap and freeze up to 3 months. Those bars must be kept in the fridge as they soften after 20 minutes out of the fridge. If you plan to eat them within few hours, freeze your bar the day before carry along frozen, after 3 hours at room temperature the texture will be perfect. It looks like the measure of sugar free maple flavored syrup is incorrect. What should it actually be? I’m excited to try these bars! Sorry for that it is well 1/4 cup and I updated the recipe. Enjoy the bar and share a pic with me if you make them, XOXO Carine. Hey! I am new to Keto and it is awesome that life saving recipes like yours exists. I am wondering if I can use any kind of vanilla extract on keto? Or does it need to be a special kind and keto friendly in some way? I have allergies to nuts. Could i use coconut butter/hempseed butter/tahini and flax seeds and maybe chia seeds instead of the nuts portions? 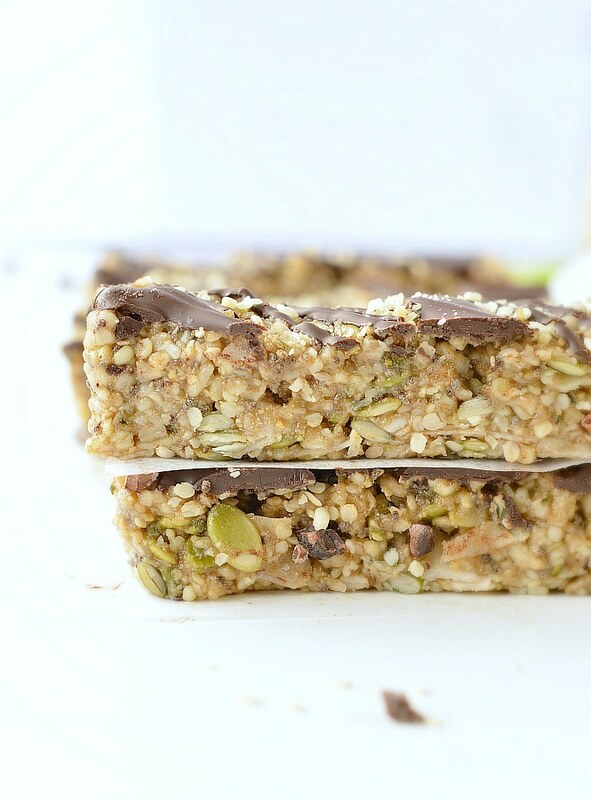 This is 100% nut free recipe you don’t need to change anything in those bars if you have nuts allergies. But yes, coconut butter (or any seed butter) will be a good substitute to sunflower seeds butter if you like. Enjoy! XOXO Carine.